PMK Accountancy Services was established in 2005 by Managing Director, Paddy McKeown as a sole trader and has now grown to a team of 17 and is a leading edge accountancy practice, providing a friendly and professional accountancy service to businesses throughout the island of Ireland. PMK’s previous site was running off a pre-built WordPress theme and was not a true reflection of the scale and scope of the business. The site was being hosted on a slow, shared server and this was not using a SSL certificate. 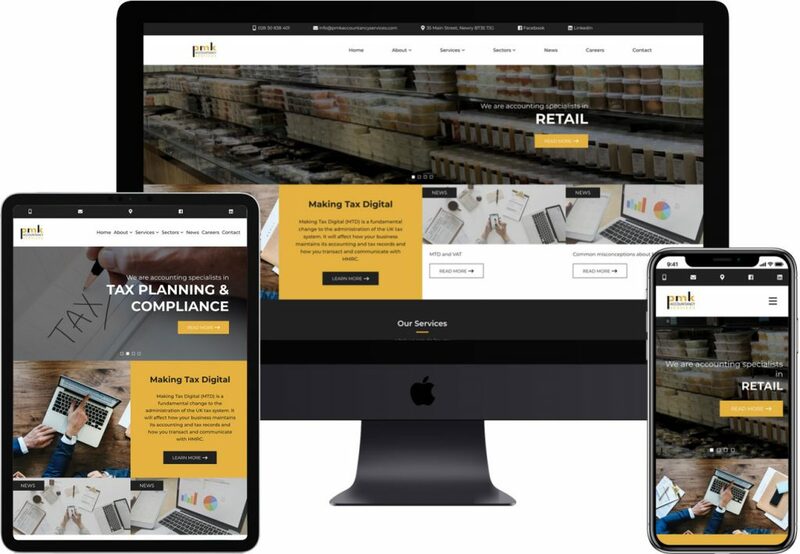 The team were unable to communicate effectivly the services and industries that they worked in – the previous site was a poor reflection on the amazing work that PMK carries out. We created a number of hugely detailed concepts across a number of devices to show how a user would flow through the new site and presented these to PMK. They were hugely detailed with a strong attention to UI and UX across all elements. We redeveloped the site in-house with a custom WordPress theme – carving out clear sections for services and sectors and allowing users to select, with ease, what they were more interested in.